Nest boxes cannot be placed and forgotten. They must be monitored. 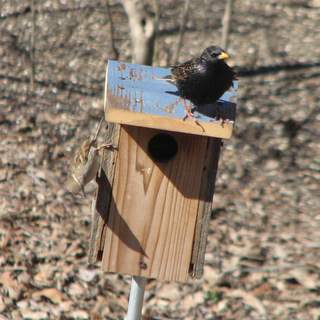 Unmonitored nest boxes become homes for invasive pest species like house sparrows and starlings. Monitoring nest boxes will make you aware if predators can access your nest boxes. By monitoring nest boxes you get to see the birds grow and mature. There is great satisfaction in knowing that you are helping our native cavity nesting birds. Nest Box Design and Nest Box Mounting are as important as Nest Box Monitoring. By monitoring your nest boxes regularly, problems can be rectified. Check for the following which can prevent birds from successfully nesting in nest boxes. House Sparrow or European Starling nesting in the nest box. Both are invasive species that will usurp nest boxes from native bird as well as destroy eggs, kill the young, and kill adult birds. They should not be allowed to nest. Used nest is left in the nest box. Once a bird has raised its young and they fledge, the nest should be removed and the box cleaned to allow another nesting of another pair of birds. Used nests are often very dirty and usually contain parasites like lice. By removing the used nest you can provide a healthy place for a pair of birds to nest. Squirrels building nest in a nest box. Squirrels will build nests in larger nest boxes like those used by flicker woodpeckers, screech owls, and wood ducks. Use a squirrel baffle to prevent squirrels from climbing the pole on which the box is mounted. Paper wasps building homes in the nest box. The wasp nest is usually located on the inside ceiling of the nest box. Birds will not occupy a nest box that has wasps in it. Mice building nests in box. This usually occurs over winter. Birds won't nest in a box with a mouse nest. Destruction of nest by predators. Mount nest boxes on EMT conduit to reduce risk of predators. Do not mount nest boxes on trees or wooden posts that predators can climb. Use a baffle to prevent predators from climbing poles. House wrens destroying eggs of nesting birds. Sometimes wrens will destroy the eggs of other birds. Locating nest boxes away from wren habitat is the only solution. Nest box needing repair. Birds won't be able to nest succesfully in nest boxes that are falling apart. Nest boxes that leak will cause nesting failure. Be sure to repair them by the beginning of the nesting season. If you aren't going to monitor your nest boxes, then you shouldn't put them up. Our nest boxes should help our native birds, not hurt them. The House Sparrow and European Starling are fierce nest box competitors. They were introduced to North America in the 1800's and since have diminished native bird populations. They will force native birds from their nest boxes, destroy their nests, and kill the adults. To successfully help our native cavity nesting birds, these birds must be controlled. They should never be allowed to nest. Learn more about European Starling Control and House Sparrow Control. The design of the nest box is an important trait when it comes to monitoring nest boxes. The nest box should be easy to open. 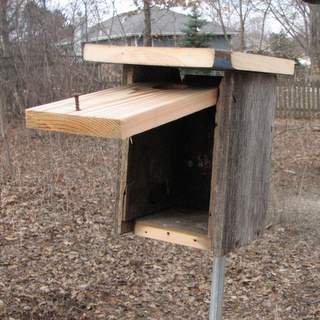 Use either a front opening or a top opening nest box.